NASHVILLE, Tenn. (AP) — Officials ejected two Florida players after a Vanderbilt defender’s helmet was knocked off on a punt return and both coaches yelled at each other as their teams spilled onto the field in a near-brawl. No. 14 Florida trailed 21-10 Saturday and was returning a punt late in the first half when officials threw a pair of flags, the second on Florida linebacker James Houston for targeting as his hit knocked the helmet off Dare Odeyingbo. Vanderbilt coach Derek Mason went to Odeyingbo, who was down near the Florida sideline. 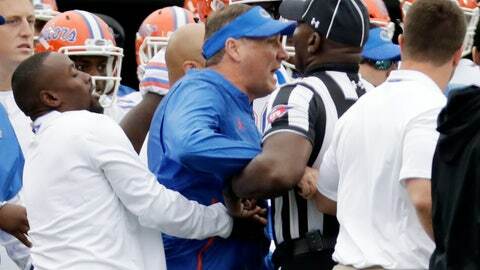 Florida coach Dan Mullen and defensive coordinator Todd Grantham were seen yelling , and Mullen had to be restrained by an official. Mason turned to walk away and grabbed Dayo Odeyingbo, who was coming out to check on his older brother. Officials announced that replay upheld a targeting penalty on Houston, leading to his ejection. They also flagged each team for unsportsmanlike conduct. That counted as a second for linebacker Vosean Joseph, Florida’s leading tackler, leading to his ejection. A pair of Florida staffers escorted an emotional Joseph to the locker room.